I've installed McAfee SiteAdvisor to my home computer and I'm impressed. In Yahoo or Google search, you can get a preview of the safety rating of the website before you click on the link. 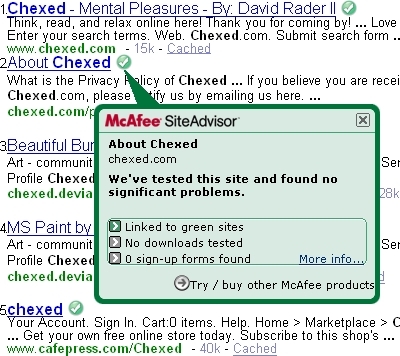 If it's good, it will have a check next to it, if not, it will have an "X" or exclamation mark next to it and it will have an explanation of McAfee's findings. So get to downloading if you want! It doesn't create an extra tool bar, thank God! Hosted by HostNine This page was created in 0.0038640499115 seconds.